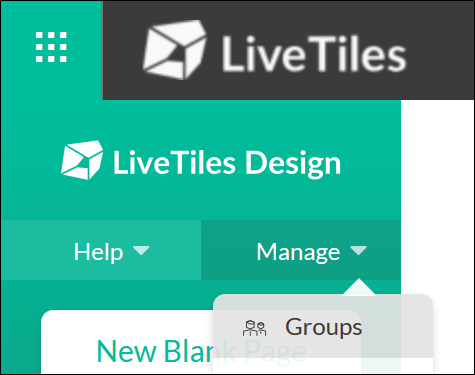 One of the first steps to setting up your LiveTiles platform is assigning Owner and Designer permissions to the site page. This will determine who has design and edit access to the site page. Navigate to the Design Landing page. Click top left Manage drop down menu. A modal window will pop up with options to add Owners and Designers. The main distinction between the two groups is: Owners can assign permissions for the Designers. Owners have site-wide design access where a Designer may be limited to a specific page. Some users will need to be given Edit access in SharePoint before they can be access the LiveTiles site page. Clicking on the hyperlink will take you to SharePoint back-end to edit permission levels. After you've clicked the + icon, a modal window will pop up to ask if you wish to notify the user by email. Notification is selected by default as it is highly recommended. Untick the selection box if you don't wish the user to be notified. Once added to the group, the user will have an X to the far right of their user name. Click this to remove them from the group.